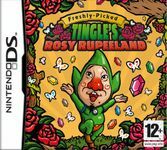 Freshly-Picked Tingle's Rosy Rupeeland is an action role-playing game developed by Vanpool and published by Nintendo for Nintendo DS. It stars Tingle, a minor character who has appeared in several games from the Legend of Zelda series. Source: Wikipedia, "Freshly-Picked Tingle's Rosy Rupeeland", available under the CC-BY-SA License.